You don’t stop riding because you’re getting old, but you get old when you stop riding! What is better than to start a brand new year with this thought and attitude. After all if you are seeking to figure out what freedom means, I bet a biker would have the most convincing answer! With everything around being new, including the year, we at Droom are happy to add to the list our newest edition of India’s Biggest Bike Mela. With this edition, IBBM just got bigger, smarter and better. One of the most amazing addition to IBBM other than the collection of bikes and jaw dropping discounts is your freedom to order the vehicle of your choice. Yes you read it write! 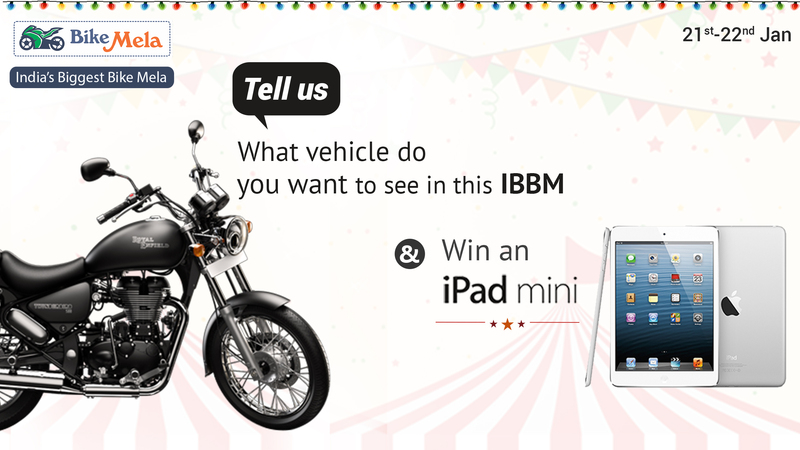 On this edition of IBBM, we want you and all our prized customers to tell us about the bikes you would like to see on IBBM and we would try our best to make it available. Visit droom.in/ibbm, tell us what you want to buy till 20th Jan 2016 and we will put that on IBBM sale just for you. And to make things even better, as we always do, by sending us your requirement you also get a chance of winning an iPad Mini! So what is stopping you? Drive to Droom.in to buy your next dream vehicle from 21st Jan 2016 to 22st Jan 2016 with bigger than ever savings through India’s Biggest Bike Mela and make that bike trip you have been thinking since long. After all God didn’t create metal so that man could make paper clips!